If you happen to have a Geo Dome and are in to camping and are looking for a natural fibre floor covering material for your tent that is hard wearing, then you are in the right place for a half moon coir mat, we have what you need. We can help you and are confident that whatever you need we can provide a service for individuals or trade customers. With a fast delivery, service second to none and all prices including free delivery to the UK mainland, placing your order is a breeze. Coir used in this product is environmentally friendly being completely biodegradable. It is long lasting, and although it looks rough the fibres are pleasant to the touch. With the advent of Glamping and festival goers rediscovering the pleasures of the outdoor life, natural half moon mats are the perfect shape and design to fit inside a Geodesic Dome. The benefits of coir are largely due to its strong fibres, making it resistant to wear and tear. Its natural qualities lend itself to outdoor camping “glamping”, not only does it look good and offer a highly textured surface, its warm and comfy to lay on, providing a fantastic insulating layer between you and the ground, forming a natural barrier against the elements when you are camping outdoors. We are one of the main British importers, our selection of Geo-dome matting conforms to the highest specifications in accordance with the India coir boards exacting standards. Semi-circular in design Half Moon Coir Mat(s) made to the premium M2BV3 specification using Vycome yarns, Panama weave, 2×2 cross thread machine stitched and hemmed with natural colour cotton for durability. 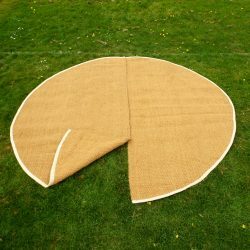 It is entirely up to you if you place the mats on the grass, or you can choose to insulate them further from damp with a ground sheet, once you have finished using them they are easy to clean, with a garden hose and brush, taking care to dry in the sun or indoors.